The West Front of the Capitol during an early morning rehearsal for President-elect Barack Obama's Inauguration Ceremony in Washington on Sunday. WASHINGTON – It was just a rehearsal for the real thing. 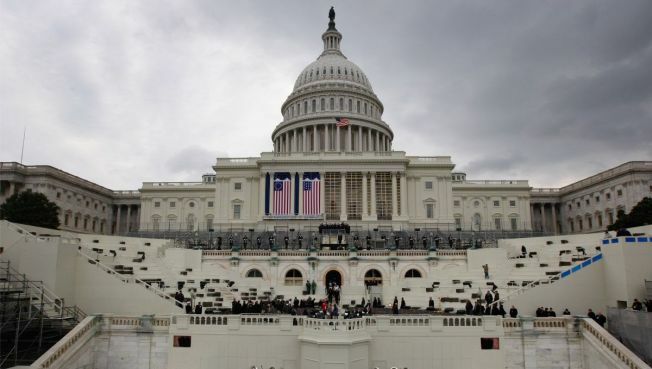 A band played "Hail to the Chief" at the west front of the Capitol in Washington and a swearing-in ceremony was followed by a helicopter flight — all part of a dry run for the presidential inauguration set for Jan. 20. Stand-ins for President-elect Barack Obama and others took their places Sunday, and thousands marched along the parade route on Pennsylvania Avenue. When the president-elect's name was announced, it was "Barack H. Obama" — not Barack Hussein Obama. During the campaign, Obama's middle name — common in the Middle East — was at times used as a negative by people opposed to his election. An inaugural official referred questions about Obama's name to top organizers.